When the worst – not the best – is made of a bad situation, the buck stops there: those in authority do pay the political price of mismanaged responsibility. So it must be for the New Zealand Prime Minister of 4 September 2010 (the day of the magnitude 7.1 Canterbury earthquake) and its aftermath, and for the PM’s colleagues. Where many died, all could have lived – but for official neglect. The dire warning that September 4th sounded – miraculously at no loss of life – should have been seriously heeded. But NZ PM ‘smile-and-wave’ John Key took no special action, except to second Christchurch Mayor Bob Parker’s haste for return to “business as usual” in the retail city. The greedy foolishness of that approach was brusquely scotched by nature, when the “Boxing Day quake” aftershock stopped the much-vaunted downtown sales that late December day. If only these two mis-leaders had been stopped there, 185 more people could have lived through the 22 February 2011 disaster to follow, through proper building inspections and essential cordons. City retail leadership is still the same though, hogging headlines at the expense of sound civil defence, just as they drew shoppers beneath lethal parapets and into faulty structures that February too. No accountability so far, no break from the PM’s dangerously narrow policy. Yet deadly warning had been received, in the form of the Pike River Mine disaster on 19 November 2010, with 29 West Coast fatalities. Methane problems in the uphill mine (pocket) could well have been exacerbated by the September quake, at the same latitude approximately, yet no remedial action was enforced or taken. Political and corporate negligence continue, at the mining families’ expense. They still wait for adequate justice. But justice is denied, under an elite-orientated, autocratic New Zealand government in service to private interest. The hearing into CTV’s building disaster bore this immorality out. Coroner Gordon Matenga, in his findings and much-publicised criticism of the NZ Fire Service response of 22 February 2011, got it wrong. Why? Few explanations exist: only two. The first would be that this judge is bent, to the venal, corrupt practise of John Key’s administration. But that remains to be proven, leaving just one other possible cause of flawed findings: that Matenga received deficient information. This we know to be the case, and places responsibility at the Prime Minister’s door. So, how was the CTV evidence flawed, and why? Missing from the CTV inquiry was the civil defence view, the element of accountability in public control, that had been obstructed on 22 February 2011 too. This is the management whose absence undermined coordination of the emergency response, whose role was to reinforce the Fire Service and Police responses – which resides with the regional council – that failed. John Key’s removal of local public authority at Environment Canterbury (ECan), on 30 April 2010 – for financial investment purposes – is thus the reason for the tragic debacle at CTV. How did this play out? Where Matenga found fault in the NZ Fire Service for “the way rescue teams worked together”, this was unjust and incorrect – they lacked the government back-up they are entitled to. For example, a central North Island Usar team cried out via news reports for transport to Christchurch, but had to wait in line. What were the obstacles to efficient rescue there? Regional coordination of military resources was the agency in the system to guarantee an airforce flight, until John Key stopped that capacity. Who else did response governance? In fatal emergencies, Police gain authority over an emergency scene – as they did at Pike River and is (fire) tragedy practise here and across the Tasman. So why didn’t Police act in the civil emergency of 22 February 2011, to claim management over the CTV tragedy and lead any more effective rescue possible, as their evidence states? Because the decision-making body over them, for directing them to that purpose – ECan Civil Defence and Emergency Management (CDEM) – had been disabled by John Key, Nick Smith, David Carter, Bill English, Peter Dunne, the Maaori Party, et. al. As repeated at the inquest, no one had the Fire Service’s back on 22 February 2011. It was Police duty there, but no one had their back either. And hence the confused breakdown of command, abortive rescue attempts, and probably additional fatalities – all due to John Key’s meddling in essential public services, to benefit select industry. But he did not act alone. Every Canterbury mayor of 2009 – especially Bob Parker – helped bring this raised civil disaster about. Parker’s unschooled ambition was an ECan CDEM disabler too. For that, for the subsequent lives lost in February 2011, he must pay a price. Voters will no doubt respond. After all, it is their relatives and friends, their overseas guests, who have already paid with their lives, injury and hurt. The fact that Waimakariri District was involved at Kaiapoi, extending the emergency beyond Christchurch City Council boundaries on 22 February 2011, is what classified this as a regional emergency to which ECan CDEM had to respond, to escalate the logistical resource. Parker’s interference and falsely-assumed leadership of emergency response – covered up by Key’s lifting events (with no alternative left) to national emergency status, wrongly – is what made the CTV response slow, disorganised, and probably a bigger fatal disaster. That we all mourn, and must learn from. We owe it to everyone lost. Quake directly beneath Christchurch The Press, 27/12/2010 + Christchurch Boxing Day earthquake explained 3News.co.nz, 3/6/2011. Wikipedia.org Pike River Mine disaster + ‘They’re still not home’ “A report into the Pike River coalmine disaster reveals New Zealand’s ‘Third World’ health and safety record for mining.. failure at virtually every level.. by September 2010.. essentially the mine should have been shut down” The Press, 5/11/2012 + “Firstly, we need to be angry, bloody angry, that this tragedy has happened and at the way the families have been treated by the government” Pike River: ‘cashflow’ versus workers’ safety Redline blog, 1 November 2012. The Canterbury Earthquakes Royal Commission report* + justice.govt.nz/courts/coroners-court/ctvstreaming witness evidence + Coroner expresses concern over emergency staff TV1 News, 7 November 2012 + Reportage of the CTV inquest cites Police and Fire Service presuming each other was in charge, causing delays and probably more lost lives. The loss of regional (ECan) Civil Defence coordination by John Key’s actions makes his responsibility in the swollen tragedy one for which he must morally and legally pay: Contradictory evidence heard at CTV inquest ibid. + NZ Police view of CTV disaster: “police were on the scene ‘within minutes’ and performing rescues. It was one of many sites that demanded a police response.. The police’s main roles were to control the cordon and manage the sudden process, while the Fire Service took command of the rescue” Police ‘not equipped, trained’ for CTV disaster The Press, 29/10/2012 + “A meeting between 11pm and midnight on February 22 to discuss a rescue plan for the eastern side of the CTV building revealed some disagreement.. Police officer in charge Sergeant Michael Brooklands, Fire Service personnel and civilian contractors were at the briefing.. no-one was rescued alive after the meeting.. there was ‘no formalised structure’ for who was in charge of the CTV site. He mentioned the need for a single leader to two senior police officers who visited the site on the afternoon of February 22.” ‘Disagreement’ over CTV rescue efforts The Press, 30/10/2012 + Engineer held up from CTV rescue by Christchurch City Council’s inept, know-all but amateur Civil Defence bungling “Communication between the agencies would be improved, with plans for a combined facility in the central-city blueprint” extended ambition “The arrival of Urban Search and Rescue (Usar) was a “big help” because members brought a more professional and structured approach” The Press, 01/11/2012 + “An Urban Search and Rescue (Usar) member who took part in the ‘chaotic’ rescue efforts at the collapsed Canterbury Television building says a senior Fire Service representative should have been in charge of the site.” CTV rescue labelled ‘chaotic’ The Press, 02/11/2012 – Scapegoating of USAR has been in the NZ Prime Minister’s interest – politically driven? Whereas the NZ public know, only too well and instinctively, that service personnel are all that stands between them and total chaos. Service personnel are the general public’s sons and daughters, mums and dads, invariably. Don’t pass the buck onto your victims, John Key! + Key’s bungling CDEM manslaughter: “The first senior fire officer on the Canterbury Television building site has defended claims he failed to establish command after the February 2011 earthquake, saying ‘the book goes out the window’. Station officer Alan Butcher told a coroner’s inquest into eight of the 115 deaths at the site after the quake that he did not have the time or resources to ‘sit back’ and take command or ask a higher-ranking officer to do so. Butcher’s Addington crew and one other crew with a station officer (SO) were the first on the scene. The two SOs did not discuss taking charge of the site, Butcher said. ‘The book goes out the window when you’re stuck like this; you are doing the best you can,’ he said. ‘There was no [time] at the time to be able to sit back and discuss. You’re in there working. The fire brigade was stretched. There’s no doubt about it. ‘Generally in an incident like that, more trucks and a more senior officer arrives and the senior officer takes charge.’ Counsel assisting the coroner Richard Raymond asked Butcher why he did not follow the co-ordinated incident management system (CIMS) designed for emergency services to co-operate in major emergencies. ‘CIMS or anything like that is not working at this stage because you do not have an overall site commander,’ Butcher said. ‘There is nobody there. You’re too busy working.’ Raymond asked whether CIMS was for ‘exactly that purpose – to identify an incident controller so that the site can be properly managed?’ ‘We were just stretched,’ Butcher replied. “There is no spare person … to command the site. '” Fire officer defends CTV decisions The Press, 31/10/2012 – By denying them regional coordination (ECan), money-minded manslaughterer Key denied the NZ Fire Service and their USAR wing critical life-saving back-up. #ArrestJohnKey! New coroners appointed NZ Govt scoop.co.nz, 6 June 2007. 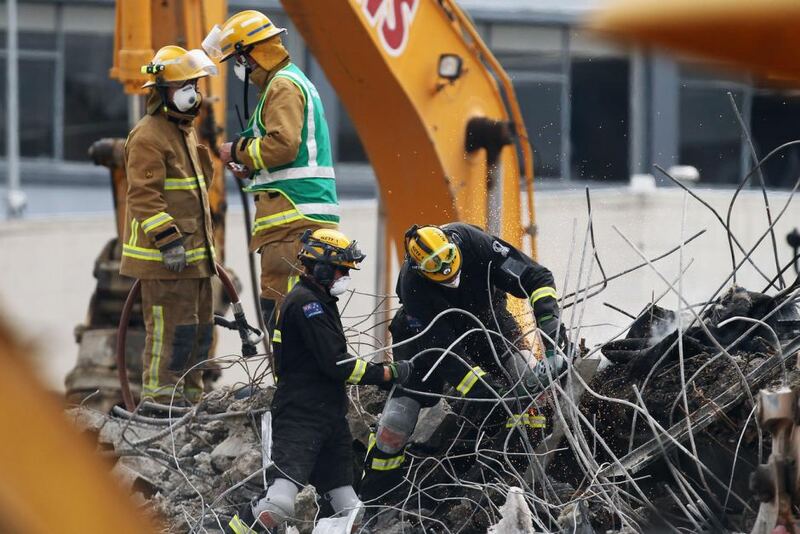 There is a criminal case to be answered by PM Key, for civil defence failure at a critical time in Christchurch. Either that or there was Police derogation of duty on 22-Feb-2011 @CTV, not the Fire Service’s. Police blame had a cause and at least ONE HEAD MUST ROLL! As bad as NZ Fire Service admin may be, that isn’t relevant at CTV; unless you are critical of the local command. The inquest made these layers into the fall guys, but is this just or not? Update 23 Feb 2013 – One down, ~63 to go. * “Civil defence and emergency management should be responsible for setting up and maintaining cordons during the state of emergency.” @ CTV EQNZ 22Feb2011. Ref. Royal Commission of Inquiry into Building Failure Caused by the Canterbury Earthquakes Final Report, Volume 5: Section 1: Summary and recommendations – Volumes 5-7 para 156. CDEM absence was Key’s main input that day – his effect on ECan – costing lives through rescue failure. KEY should RESIGN NOW!